The setting sun gives the rushing water a golden hue as I ride the Lynx trail, one of my favourites that follows the Diable river. The amazing landscape makes it easy for me to get lost in thought and I find myself thinking about what great surprises this new season will bring and all the amazing memories that will be created over the next few months. I think about the laughs I will share with the people I care about, the hooting and yelling that I will be doing with the Trail Trybe kids and most of all, the special feeling of seeing all the hard work pay off when everything comes together at an important race. These thoughts warm my heart and give power to my lungs and legs as I start to speed up, sprinting towards these special moments that await. Having just returned home from the West Coast where I was attending the University of Victoria, it feels great to see all the familiar sights, ride the roads and trails, and spend time with my family. Time at home is short lived though, as the racing season gets underway and I will be spending a lot of my time on the road travelling to various events. I have to learn to really appreciate these moments at home and carry them with me when I travel. The first major event of the year will be the World Cup in Albstadt, Germany, on May 22nd, followed by the World Cup in La Bresse, France, just a week later. I will be travelling with the Cycling Canada NextGen program, a development team for the Canadian National Team that aims to get its riders to the next level. I am very proud to be part of this very exciting program, even if being involved with the program requires some sacrifices. The biggest one for me was missing the Mont-Tremblant Canada Cup, a race that I hold very close to my heart and where I made my debut on the national cycling circuit. It is a big disappointment for me to miss the chance to race on my favourite course in front of my friends and family, but I am motivated by the fact that I will instead have the chance to prove myself on the world stage at the world cups. It is an exciting challenge that I am looking forward to and I am confident the lessons I have learned from racing the Tremblant Canada Cup will help me in Europe. My other big goals for this summer are the World Championships in the Czech Republic, the National Championships, and the World Cup in Mont-Saint-Anne. I also plan on running my Trail Trybe bike camp and working on creating a more solid platform to help introduce people to the sport of mountain biking. To celebrate the third year and the growth of the camp, I will be offering 3 camps this year. For more information, please visit www.trailtrybe.com. I chose the name Trail Trybe because all of us at the camp are linked by the passion of the sport, which is represented by the trail. We ride together and take care of each other, connected by the fact that we are all riding the trail for the same reason, regardless of our differences. I was inspired by the nomadic tribes of Mongolia. Riding with kids helps me recognize what the sport is all about and I really enjoy it. 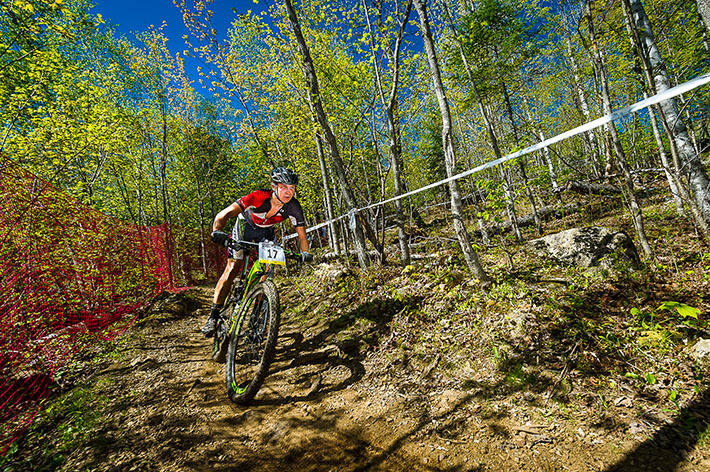 I hope that this camp is an important step in making Tremblant an established mountain bike destination and will encourage the growth of the sport in the region. There are a lot of exciting events to look forward to this season, but I also hope to enjoy the little things as much as the ones that stand out as important events, such as running with my dog in the morning, watching a movie with my family, or cleaning my bike in the front yard. I am really grateful for everything in my life and I plan on enjoying every part of it.